Sometimes, the more obvious something is, the harder it is to acknowledge. We can’t see the elephant through the forest in the room… for the trees… or something like that. California and a significant portion of the U.S. are well into a severe drought predicted by NASA to continue for many years, and groundwater supplies are being rapidly depleted. 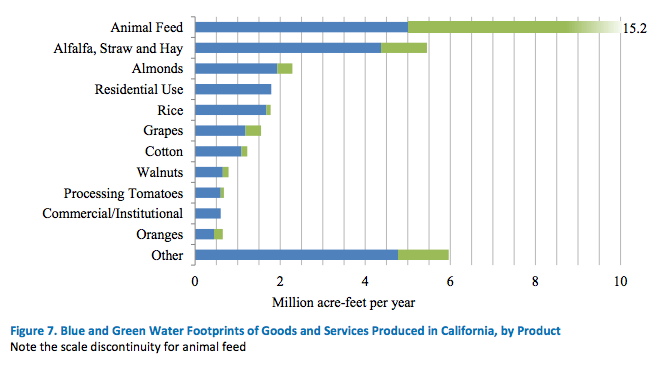 Yet meat and dairy account for nearly half of water use in California – and more than half in the nation. “Animal products form the single most important factor in humanity’s water footprint” and “we need to re-examine the place meat and dairy have in the diet of modern man.” PETA? Nope – Water Footprint Network founder Arjen Y. Hoekstra, PhD, who is creator of the water footprint concept, has had multiple publications translated into several languages, and has advised government and multilateral institutions like UNESCO and World Bank. “It sounds glib, but we can eat our selves out of this problem… Less meat; more water.” That would be world renowned water scientist and Stockholm Water Prize Laureate, Professor John Anthony Allan, who makes it clear that the vast majority of water goes to agriculture and that vegetarianism – which he has referred to as “the magic demand management thing that could be done” for global water security – would cut that massive footprint roughly in half. Not coincidentally, these two men – two of the world’s leader water scientists who have invented concepts used globally to measure water consumption – are themselves vegetarian. Their own research left them with no other conscientious choice. This is because animal-based foods require the most water – we’re talking way more water – to produce than plant-based foods due to the amount needed to feed, service, and slaughter boatloads of animals. Would you believe two-thirds of all agricultural land is used to grow livestock feed? A fraction of the water, land, and other resources can be used to instead grow crops we eat directly or even process, which would significantly lower our carbon footprint as well and eliminate a host of other environmental and health problems. The only thing that makes it possible to rear 70 billion animals on our planet annually is the drawing of rivers and aquifers far faster than they can be recharged. This is an inevitable disaster waiting to happen, with or without drought – and drought certainly heightens the urgency of the situation, as we are seeing now. Per the Washington Post, the world is running out of water and the situation is critical. 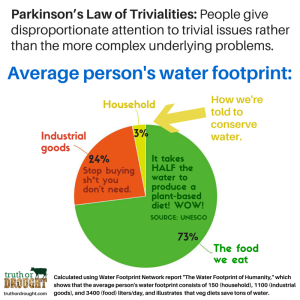 Both Hoekstra and Allan emphasize that while being mindful of water used at home for things like lawns and showering is certainly not a bad thing, our most impactful water conservation focus by leaps and bounds needs to be what’s on our plates. Saving what’s left of our increasingly scarce water clearly requires no longer breeding these billions of animals, which means no longer needlessly basing our diets around their meat, milk, and eggs and instead choosing delicious, compassionate, and far more water-efficient plant-based options. This would lower the food-related water footprint of industrial nations by minimally a third – and since the vast majority of our water footprint is food-related, this represents the single most significant water-saving effort humanity could possibly make. This more conservative comparison from National Geographic shows that a a massive amount of water is being saved by either estimate. Get this lawn sign for your yard or window at www.truthordrought.com. But our collective blind spot when it comes to animals raised for food means the astronomical amount of water they require flies under the radar, even while the water footprint of everything else under the sun is scrutinized. Perhaps we forget about them altogether when most of them are crammed into warehouses and feedlots. A New York Times headline screamed earlier this year, California Drought Tests History of Endless Growth. Yet what’s actually being tested is the endless growth of our water-guzzling meat culture and our utter inability to recognize that. 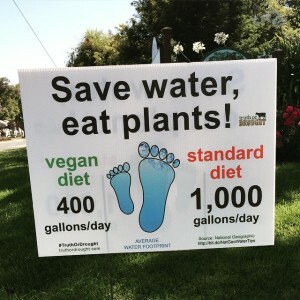 47% of CA’s water footprint is associated with meat and dairy (Pacific Institute) along with more than half of all freshwater used in the entire United States (Center for Science in the Public Interest) even though a vegetarian diet requires half the water to produce (UNESCO) and a vegan diet, which is healthful and appropriate for individuals in all stages of life (American Dietetic Association), saves 600 gallons of water per day (National Geographic’s conservative estimate) – making it clear why leading international water scientists say our diets need to be minimally 95% vegan by 2050 to avert catastrophic crop shortages (Stockholm International Water Institute [SIWI]). And no, water researchers like Pacific Institute don’t including the large amounts of “environmental water,” which is not used in their accounting for how water is used, although some people would apparently love to drain every lake and river dry to grow yet more livestock feed while blaming environmentalists and the naturally existing Delta smelt and other pesky elements of awe-inspiring nature for our water woes rather than tens of millions of artificially-bred livestock animals. Although it’s rarely stated or acknowledged, the largest chunk of California’s water goes to feeding cattle. This perhaps isn’t so shocking when we consider that statewide, livestock animals outnumber humans by roughly double – including more than 5 million massive, water-guzzling, crop-inhaling bovines. The state’s Central Valley Aquifer, now called the most troubled in the U.S., is drained mostly for this purpose, as this is where 70% of the state’s thirstiest crop, alfalfa hay (fed mostly to dairy cows), is grown. Not so coincidentally, the ground there is sinking at a rate never before seen per USGS, nearly a foot a year in some places, and houses are actually starting to sink. The sinking ground is leading to collapsed bridges, cracked irrigation channels, and twisted roads. This infrastructure damage poses a flood risk where levees and canals also sink, which could eventually render them unusable. We desperately need to let the groundwater be replenished, but because a lot of the ground has already subsided and now the storage capacity is gone, we will be unable to ever restore some of this area that covers about 660 square miles of the Central Valley of California. Instead, it continues to be pumped mostly to grow feed to briefly sustain doomed animals destined for the slaughterhouse. Unbelievably, two-thirds of California’s groundwater losses are attributable to groundwater pumping (again, mostly to grow feed) in the Central Valley, which is also the second largest methane concentration “hot spot” plume in the United States. Methane is an especially powerful greenhouse gas emitted by ruminants like cattle. Again, not so coincidentally, California’s greatest concentrations of cattle are in the Central Valley, where through no fault of their own they are baking the planet while simultaneously draining it dry. Meanwhile, residents of the Central Valley in their sinking homes and the general public and the media – and even environmental groups, as brilliantly captured by the documentary film Cowspiracy – continue to eat and promote beef, cheese and other meat products daily, if not at every meal, while talking about the need to save water and reduce greenhouse gas emissions without connecting one thing to the other. It is truly wild. As Ara Marderosian, Executive Director of Sequoia ForestKeeper, observed eloquently of the Central Valley situation, “Water storage capacity collapse could be a harbinger of the collapse of our meat-based civilization.” If these words sounds extreme, I’d like to issue a friendly reminder that the most water-intensive food on the planet lest we start domesticating elephants, bovine burgers, is the single most frequently eaten food in the whole world. Think about it this way: even though California produces at least half of all – and up to 99% of several – U.S. fruits, vegetables, and nuts, but only 21% or less of any U.S. meat or animal product, guess which food group uses the most water? 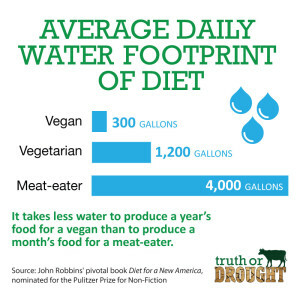 Yep, meat and dairy account for nearly HALF of the state’s water footprint. 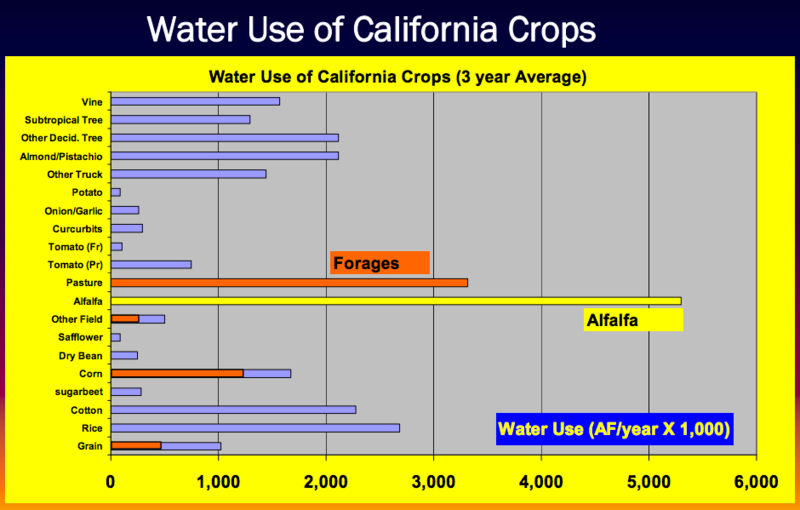 20% of California’s agricultural water goes toward producing alfalfa hay alone, which is more water than any other state crop receives – even almonds, which, considering that they use 9% of CA agricultural water to supply 80% of the entire planet and 99% of the nation with nutrient-dense monounsaturated fats, are actually a freaking water-efficiency rock star compared to any animal product. Are you with me, here, people? 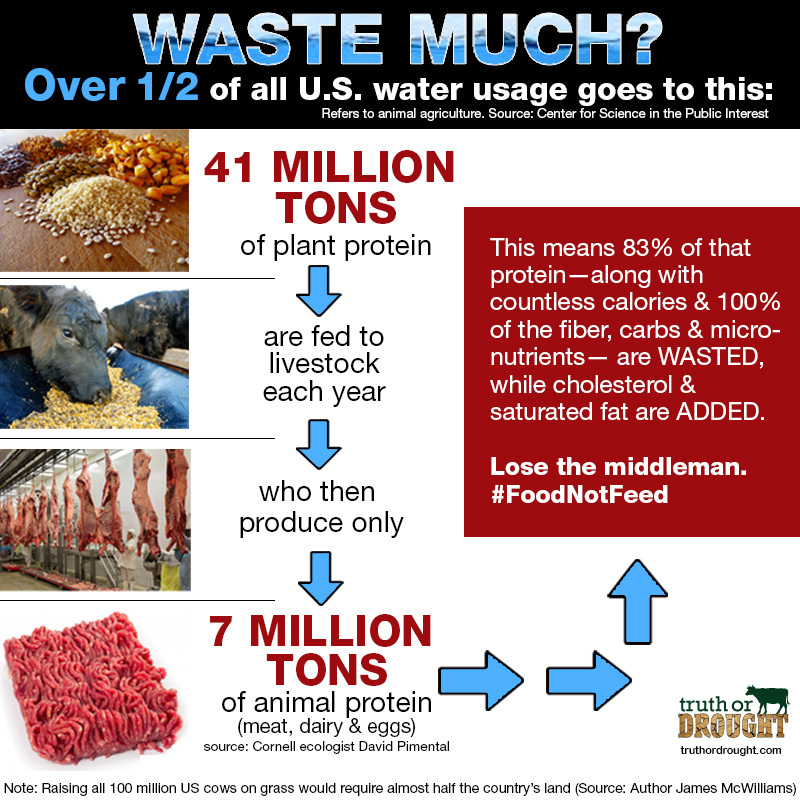 Are you seeing the wildly disproportionate amount of water used to produce the much smaller yield of animal-derived foods? To add insult to animal injury, kitchens using meat can’t reuse their water as gray water due to the bacteria, while meatless kitchens can. Face palm. Yet without the ability for most to acknowledge or accept any of these glaring facts, let alone make the appropriate behavior changes, Niagara Falls continues to crash by us unchecked in the form of cheeseburgers while reservoirs and taps run dry and we “drought shame” people over wet sidewalks and long showers. 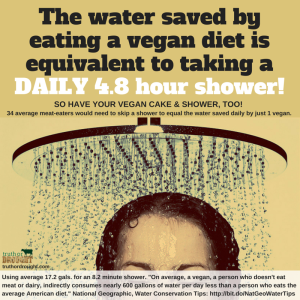 Yet that’s exactly how much extra water the average meat-eater uses every day. Even just choosing a veggie burger over one made from a cow saves 579 gallons of water, equaling 9,264 8-oz glasses. Yet we have burger-slinging restaurants “proudly doing their part to save water” by only serving a water glass upon request. We have mapped the human genome, but we can’t see how dumb this is? For the record, Marderosian and several other environmentalists penned a throughly sourced comment letter submitted to the state water resources board that I was privileged to sign on to pointing out that the California Constitution prohibits the “wasteful and unreasonable” use of water – adjectives we feel are highly appropriate to describe using almost half of it to mass-breed and feed livestock animals as a highly water-intensive and greenhouse gas-emitting and unnecessary food source. So far, crickets. NBD, it’s just the leading global authority on water footprints saying so. Altogether, it supposedly averages out to one in every eight meals consumed in the U.S. whose contents were produced entirely in California, so this issue affects us all and will dictate food prices nationwide. The reality is that whether an area is dry or tropical, our overall available land can’t come close to meeting our current demand for meat products. If it could, I’d like to think we wouldn’t be tearing down rainforests and draining aquifers to produce this stuff. Cattle ranching is the number one culprit of deforestation in virtually every Amazon country and accounts for 80% of deforestation. This gives eating a hamburger at the Rainforest Cafe a very special kind of irony. Here in the U.S., per National Geographic, the use of water to grow livestock feed is the leading cause of groundwater overdraft in the High Plains. And of the drying of the Rio Grande. Oh yeah, and also of the Colorado River. Let’s revisit that soybean thing again for a sec. “Because soybeans are high in protein,” explains the North Carolina Soybean Producers Association, “they are a major ingredient in livestock feed.” Wait a minute – I thought we were supposed to eat the livestock animals because they’re high in protein? “Soy foods are cholesterol-­free, excellent sources of high ­quality protein, and they offer a healthy mix of polyunsaturated fat,” brags the Wisconsin Soybean Association. But hang on, doesn’t meat have cholesterol and saturated fat? So we take the beans and add bad things to them that weren’t there before? “Animal agriculture is a soybean farmer’s #1 customer.” Gotcha. Guess we won’t ask questions, then. You know how ridiculous those old cigarette ads now look to us? How about this 1964 gem from the NGCA Corn Curriculum: “The soybean meal had lots of protein in it, and Ann knew protein was important to young animals growing fast. Protein was important to growing kids, too. 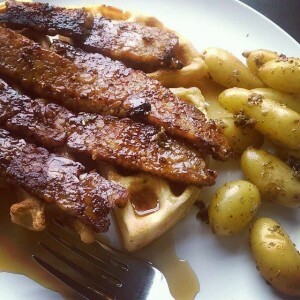 Her grandma always said, ‘Eat meat to get your protein’… And meat from pigs was important to keeping her body healthy and strong.” Again, there is apparently a need to use a deceased animal as a magical protein conduit for beans because why exactly? The only difference is that we’re still believing this nonsense. Here we have the National Cattleman’s Beef Association claiming [hyperlink auto-downloads word doc] in a 2003 “Factoid Fighter”: “FACT: Getting sufficient protein without eating meat is possible but it takes dedication and a large stomach.” #FACT! People always ask vegans where they get their protein, but the question should be where everyone else put the protein. Overall, each year in the U.S., per Cornell ecologist David Pimental, an estimated 41 million tons of plant protein is reduced to just 7 million tons of animal protein, representing a shocking 83% loss. This explains why the World Hunger Program at Brown University finds that plant-based diets can feed billions more people – yet billions of human beings go hungry each day. I don’t know about you, but veganism had me at that particular hello. If we were to put protein-rich foods through a machine that shot only a fraction of it out weeks, months or years later – minus the fiber, carbs, micronutrients and antioxidants but with the addition of saturated fat and cholesterol plus massive amounts of waste, pollution, greenhouse gases, and needless animal slaughter on the side – we’d probably consider that machine a very bad investment. So why is the food we cycle through animals actually cheaper than just buying the soy, corn, or grain-based foods in the form of a veggie burger or, say, a freaking salad? Here’s how. 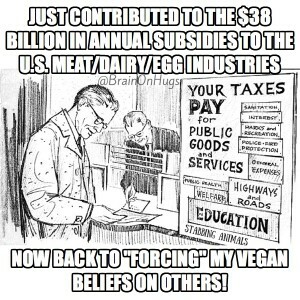 The rabbit hole deepens: In the U.S., taxpayers hand over $17 million annually to subsidize fruits and vegetables, but $38 billion (that’s billion with a B) for the needless use and slaughter of sentient beings for meat and dairy production. It seems a lot more than “beliefs” are being forced on some of us. This artificial food chain is made possible by our tax dollars and keeps agriculture artificially larger (and more profitable) than it needs to be on an astronomical scale and allows for the unsustainable exploitation of finite resources, which benefits those profiting from it, whom it behooves to keep the public convinced that anything about this process is remotely logical, which they accomplish with a pervasive onslaught of meat and animal product marketing that has created social norms that began in the 50s and continue to this day, affecting everyone from the media to policy makers. Yet those of us who just eat the crops directly, thus conserving huge amounts of the Earth’s natural resources every day and eliminating the need for lovable animals to be reared and killed, are the high-maintenance ones. Welcome to the Meatrix. Let Them Eat Rotationally-Grazed & Grass-Fed Steak? But if you want to geek out about it academia-style for a bit, here my friend Mike Hudak, PhD, author of “Western Turf Wars: the Politics of Public Land Ranching,” breaks it down for Sierra Club “Grazing Team” members (just, no) on why that whole holistic management/rotational grazing thing proposed so passionately by an Earth-saving foiled mass murderer of elephants and other lovable ranching industry characters and assorted meat lovers is nothing but a (cow) pie in the sky. 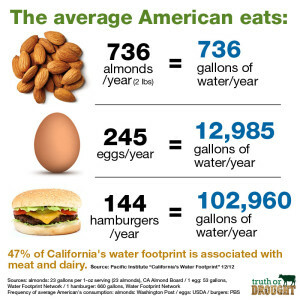 It may seem outrageous that a single almond requires about 1 gallon of water to produce (a serving is 23 almonds) – but not when you consider that a single egg requires 53 gallons, a hamburger 660, and a gallon of dairy milk 880 gallons of water to produce. And almonds are consumed quite sparingly compared to eggs, meat, and dairy, the true water-guzzling luxuries that are nevertheless treated as a main dish. Due to such undeniable science, U.S. News and World Report predicts California will export less meat and more fruits and vegetables. “The water used for agriculture is a far bigger challenge than the water used by people taking long showers or washing their cars. Meat is the biggest challenge,” they say, noting not just the water the animals drink, but the water needed to grow the plants they eat. Not even fracking or Nestle bottling water, although I certainly don’t condone either, come close to the water footprint of California animal agriculture. It can be estimated that the state’s largest beef producer alone, Fresno’s Harris Ranch, not-so-affectionately nicknamed “Cowschwitz,” uses more water in a single day than either of the former use in an entire year, using the ranch’s own numbers of 150 million pounds of beef produced annually. “It does seem important to understand,” writes Justin Fox of Bloomberg View and the Harvard Business Review, “that raising cattle takes up more of California’s water than any other activity.” Ya think? He adds, “It is pretty clear that if we just ate [here he describes vegan food in an unimpressed manner], California would have more than enough water to go around,” but then quickly brushes this solution off. Does this look like lettuce and porridge to you, dude? 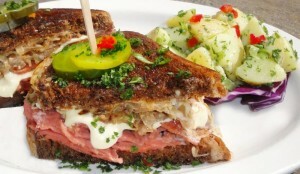 Native Foods Cafe’s Classic Deli Reuben (100% vegan), made with alternative protein seitan. 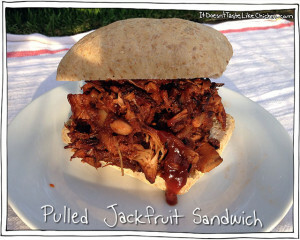 Photo: Native Foods blog. Here, the “clear” solution to effectively end the California water crises is dismissed (!) 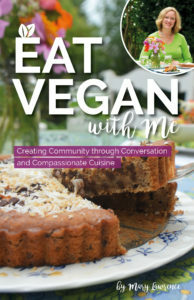 due to the author’s own preconceived notions, which most of the population unfortunately shares, that vegan food is bland and boring. 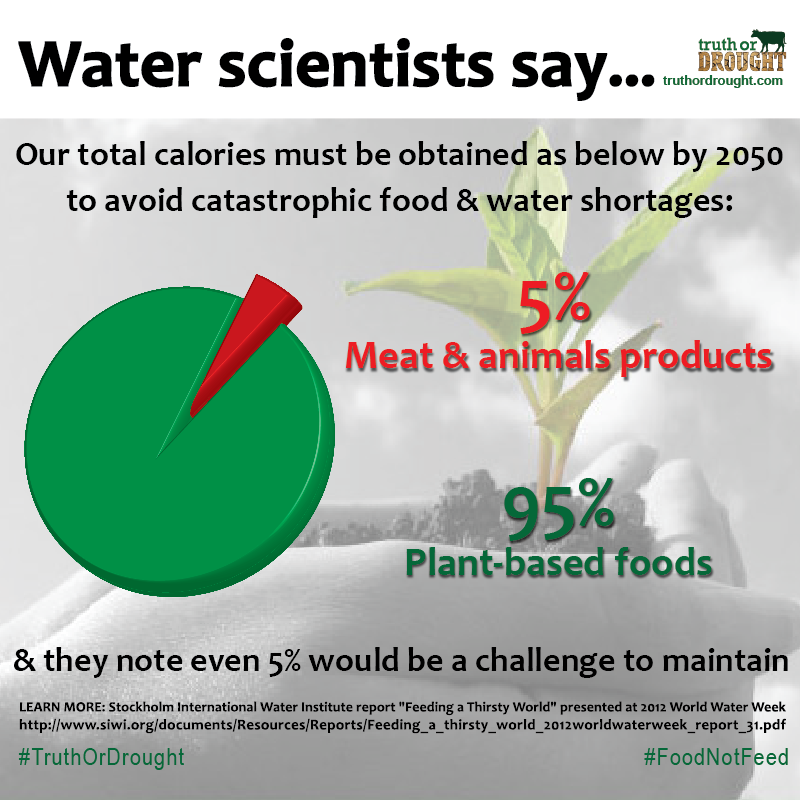 Wouldn’t you think the only way to stop devastating water depletion might be worth a tad bit of investigation – like, maybe two seconds spent on Instagram looking at #WhatVegansEat? I can assure you that millions of people wouldn’t be so enthusiastic about being vegan if we were just eating things like “lettuce” and “porridge,” whatever that is. And many leading researchers echo this sentiment. Surprising is one word for it, although you could also go with, say, mind-boggling. Nooooo, we couldn’t involve the consumers, could we? Of “the situation” regarding the livestock business, the UN Food and Agriculture Organization says urgent action is required due to it being “one of the most significant contributors to today’s most serious environmental problems” and all, such as being “among the most damaging sectors to the earth’s increasingly scarce water resources.” Meh. Meanwhile, Oxfam urges: “Choosing beans instead of meat can help relieve the immense strain our water resources are already under, and help secure safe food supplies for everyone’s future.” Safe food supply, schmood supply. But if we’re reduced to a lifetime of beans and tofu, is it even worth living? Read on. In the 1964 book “Proteins: Their Chemistry and Politics,” which includes a foreword written by then-executive director of UNICEF Maurice Pate, Dr. Aaron M. Altschul says, “No matter how it is analyzed, there is no question that the cost of animal products is materially greater than the cost of vegetable products.” He points out that meat requires around 25 times as much water per pound as vegetables, with animals providing the smallest yield of protein. I repeat, smallest yield of protein. However, like Fox, Altschul was less than jazzed about the clear conclusion that a plant-based diet is needed to effectively feed an exploding population. He noted the “almost universal lack of enthusiasm” for replacing animal proteins with plant proteins, adding that plant foods must have enough variation to “counteract monotony.” Tell us how you really feel, doc. 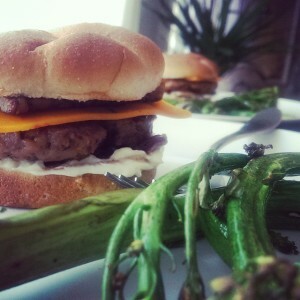 Field Roast Hand-Formed Burgers with Chao cheese and Just Mayo – sometimes we eat them 3 times in one week. Shhh. Countless world-renowned doctors and scientists and some of the greatest thinkers of our time champion a plant-based diet, such as the next president of the American College of Cardiology, Dr. Kim A. Williams, and Dartmouth physicist Marcelo Gleiser, who recently stated, “Yes, meat tastes good. But we have to start asking ourselves how long we are going to ignore what is obvious — that our meat-eating culture is not environmentally sustainable.” Those pesky Ivy League astrophysicists. 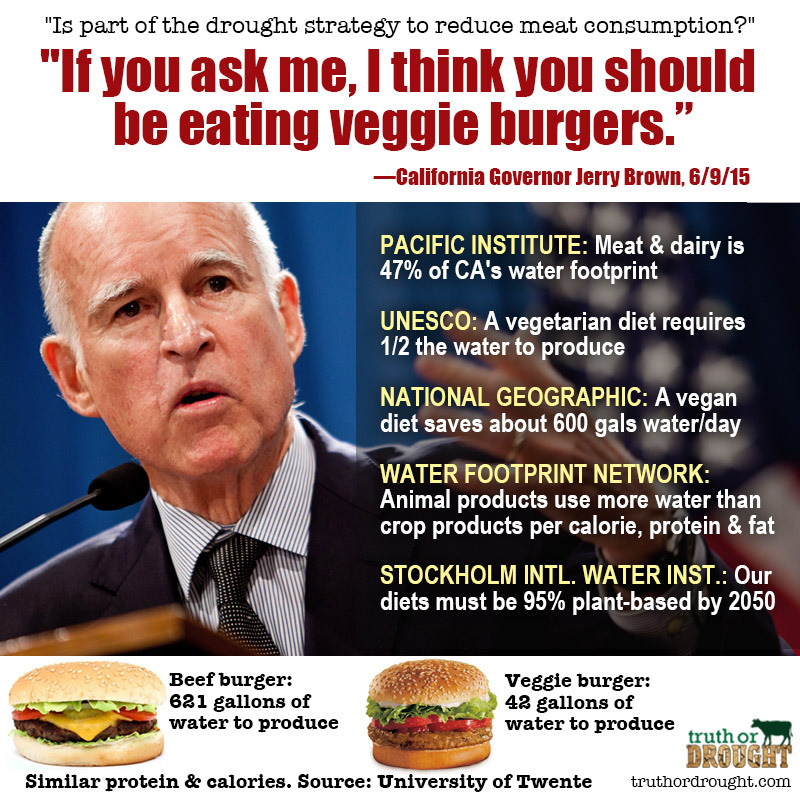 Heck, even California Governor Jerry Brown, when asked about alfalfa’s water use, admitted, “If you ask me, I think you should be eating veggie burgers.” Tip: Field Roast’s juicy hand-formed burger patties will change your life (while saving others’). In a cowburger-crazed world, this is quite literally probably the most important sentence a politician could utter today to actually help put the breaks on climate change and global resource depletion in a realistic time frame. SOURCE: Truth or Drought. So there you have it, and thank you for sticking with me through this ridiculously long blog post. I hope you agree that we can eat totally yummy, healthy, plant-based foods without harming our non-human friends or having to build the Thunderdome above a cracked, barren landscape. Leading international waster scientists, whom we can assume know a thing or two about this, say we absolutely must. Former World Bank Vice President Ismail Serageldin famously said in 1995 that “the wars of the next century will be fought over water.” While that’s a terrifying thought, the preemptive strike we can take consists of a simple action that is the opposite of violence and will result in abundance, not scarcity: veganism. If there’s a silver lining, U.S. drought may be what forces us to finally ditch our incredibly cruel eating habits that conflict with our inherent animal-loving natures and undermine our own food and water security. As ex-Citibank exec turned powerfully moving vegan speaker and advocate Phillip Wollen says of animal agriculture, with a nod to Victor Hugo, “There is nothing more destructive than an idea whose time has passed.” Let’s hope the day is soon coming when the elephant in the room – and all the trillions of discarded animals she represents – finally leaves the building. Lorelei Plotczyk, an MBA with Environmental Management specialization, is a vegan environmentalist content-producing bassist behind vegan humor page Brain on Hugs and founding member of grassroots organization Truth or Drought. She invites you to grab leaflets and signs to annoy people with at truthordrought.com and to sign the petition asking Save Our Water to freaking give Californians the #1 water-saving tip already. Lorelei is a tireless champion for drought-related vegan issues here in San Diego and beyond! Her wry humor and superb graphics make a complex subject digestible to a wide audience. Kudos! If I may I would like to point out some obvious problems with this anthropocentric article. 1) Avoid using speciesist language like “livestock” and “cattle”. 2. Explain what veganism is first, that it is an ethical position and not a diet. Vegans reject using animals for food, clothing, entertainment or other reasons. 3. If one is encouraging others to go vegan, then the most IMPORTANT reason one should put forth to the public as the main reason to be vegan is because sentient beings deserve at least one basic right not to be used as property. It would be really great if those who call themselves vegan would stop appealing to our self-centredness and speciesism when presenting reasons why we should be vegan. Wow! Good read. You opened my eyes to what an awesome person I am. I went vegan years ago but this is not this reason. I was a diabetic with high blood pressure and cholesterol. None of that is no longer an issue. Now I have more ammunition for convincing people that being a vegan is a far superior lifestyle for health and well being. Thank you so much for publishing this fantastic summary of why we simply cannot continue breeding livestock animals Lorelei. This blog post is exhaustively sourced with links right at your fingertips. This is what the Save Our Water campaign should post first and foremost on their site. Great job Lorelei ! You have my never ending respect for your tireless efforts to advance the real food movement cause. Thank you so much !!!! Very informative and well written article, thank you.